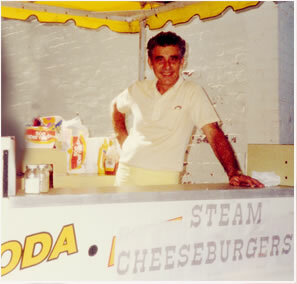 Often called a Steam Cheeseburger chest, or steamer, The Burger Tender is the best kept secret in New England, only well known in central Connecticut. It is especially popular in Meriden and Middletown with both of these cities competing for the honor of originating this "steamed" delight. Steam cheeseburgers cooked with a BURG'R TEND'R are found in diners, fine restaurants, food carts, in fraternal organizations, on fair grounds, etc. throughout this area. Both profitable and popular they have been featured at the Eastern States Fair by Rosco's of Hartford, Ct.,and the Durham Fair by the V.F.W. Their popularity has been written about by Mississippi gourmet author John T. Edge in his book "Hamburgers & Fries". Closer to home, Head Chef Jamie Roraback of the Connecticut Culinary Instute demonstrated it on NBC's Saturdays Today Show.